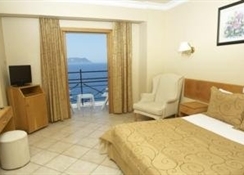 The Hera Hotel in Kas is a charming 4 star hotel, fully air-conditioned and offering a private jetty, a fabulous pool area and plenty of dining options with Turkish cuisine. The guest rooms are modern and spacious with light furnishings and a well fitted private bathroom. 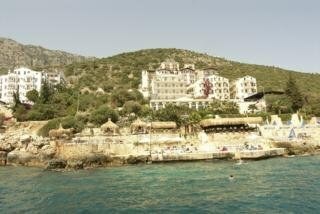 Hera Hotel is in the delightful unspoilt resort of Kas on the Turkish Riviera. 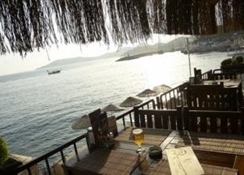 Hera Hotel in Kas will rest your mind and body and, be kind to your budget in the process. Book a holiday here in Turkey and treat yourself in style. Getting to the hotel: The distance from Antalya Airport to Kas is 200km and driving time is 2.5 to 3 hours. Dalaman Airport is nearer at 140km and takes 2 to 2.5 hours by car but is open only during summer season. Local Tips: A pretty little fishing village, Kas has plenty of local charm with cafes and restaurants to relax in while you soak up the local character. The surrounding countryside is great for walking and there are historical attractions nearby. Food, drink and entertainment: 3 restaurants, a breakfast hall, and a snack bar, all serving Turkish and International cuisine; a pool bar with service on the jetty. Sport, games and activities: Swimming pool with a children's section, Turkish bath, sauna, massage, Jacuzzi & Fitness Centre (some facilities may incur a local charge). There is also table football and table tennis in the games room and there is a private beach jetty for sunbathing and access to the sea. For the kids: Children's section of the swimming pool and a games room. Additional: Reception services with internet access, laundry service, 24 hour room service, housekeeping and safe deposit boxes are available for rent. The Hera Hotel offers spacious guest rooms with modern furnishings that feature a direct dial telephone, shower and WC, hair dryer, a mini fridge, satellite TV & air-conditioning. The single, double and family rooms also have a delightful balcony (promotional rooms are without balcony).